I was just getting out of my car at football yesterday evening when my attention was caught by sound of Coldplay pumping across the car park. I glanced around and saw that the soaring guitar of "Talk" was coming from a convertible Saab being driven by a middle-aged guy with no hair. I shook my head a little sadly at how tragic it all was and hurried on to the changing rooms to get ready for the game. Today, as I was driving home from work, I suddenly realised that I was not only listening to Coldplay but I was also lustily singing along. It dawned on me that as a balding man in his 30s, someone could quite easily pass the same casual judgment on me as I had passed only the day before. Yeah, alright... I don't drive a convertible and I'm probably a touch younger, but....ooops. It could have been worse though: I had Thin Lizzy on in the car yesterday. 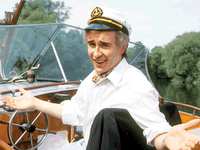 Get caught singing along to that in your car and you probably *are* Alan Partridge aren't you? ...the usual selection of flotsam, ephemera and ropey heavy metal. As you know, I've been listening to Thin Lizzy this week. One of the things that struck me the most about this experience was that latter-day Lizzy sounds remarkably like a sub-standard Iron Maiden. I suppose this was their attempt to get included in the New Wave of British Heavy Metal, but to be honest it just made me want to go and listen to the real thing. So I did. I think there would be a lot less hate in the world if more people put on a string vest, grabbed a tassled leather jacket, put their foot on a monitor and strafed an imaginary crowd with their bass guitar. Another one of Walker's Brel covers. Ah, that winning comparison between women and dogs. The ladies love that. I think I'm going to blame Leah for this...... she included a Phil Collins song on her shuffleathon CD to Mark. My first reaction was one of amusement; then horror; then it simply turned into incredulity that - if you had to include a song by Phil Collins - it wouldn't be this one.... and so the seed of the song was planted in my head. Yes, it does have a great video with helicopters and cameras on big boom arms and stuff.... but it's still Phil Collins innit? It's that bloody whistley bit. Grrr. Mandy's right, this is a brilliant song. This was played (very well) during the "Chainsaw" interlude at last week's Billy Joel gig. It's a fantastic song, isn't it? That's a monumental riff. There is nothing fashionable about Gene. Nothing. Never has been and never will be. In their early days they were slagged off as being a Smiths covers band, and in their later days they were ignored as an irrelevancy. Inbetween, they didn't sell all that many records. I thought they were great. "Drawn to the Deep End" is a marvellous album with lots of wonderful songs on it. I could've picked almost anything off this, but it's this one that's in been in my head this week. It builds beautifully and has a great chorus. Yeah, alright. So Gene never wrote anything as catchy as this. One of the most memorable bass breaks ever? So we're getting up and going down"
They weren't a very complicated band, were they?